An apology. – My thoughts on a page. I must admit many things about myself. Primarily that I am selfish,lazy and rude. and you have me summed up pretty well. in my attitude to Awards. and to read other peoples awards posts. and to know that others are seeing my blog linked. However that is where my love for Awards ends. and get the logo to appear on my page in the right place. it is time to actually answer those questions. and then link to each one of them. After an eternity, at last the post is ready. that I love them enough to have nominated them. because I really like you!”. and spent the two days writing the post. I have sat back and breathed a sigh of relief. Within days another nomination arrives! I redden up and I feel sick. The blog buddies I never said an official “Thank you” to. “Thank you, Thank you, Thank you“. I am most grateful you considered me. so I cannot thank you all personally. the catalyst for this post. Thank you, you mortified me into action. from feeling I am not a team player. Instead I have begun to try to give back in a different way. (yes it is a take on the illusive “Freshly pressed). I link to them and readers can check them out. and they will not have to do any work! for every single award I was nominated for. I’d prefer to write a real post”. I hope we can still all be friends! My wish for the class of 2013. Thank goodness I am not alone! I felt so ungrateful not writing the acknowledgement posts but I got so far behind. It will be a relief to have posted my confession and apologies. I know the feeling, I stopped accepting those awards, I started out with good intentions, I did the 10 things about me, I linked to the bloggers, then nominated other bloggers and after receiving eight in the same week I crawled into a corner and died….I just couldn’t keep doing it over and over again so I gave up. It’s a nice thought and much appreciated but it gets tiresome very quickly. Ha ha. Brilliantly described. “Crawled into a corner and died”. Its out there now and although I feel very ungrateful I also think “phew!”. I love your honesty! I love getting the awards too but that last one was a doozy to write and I was very relieved when it was finished…it sure is a mountain of homework taking away from more interesting posts. But, again…they are pretty fun to receive a little pat on the back. 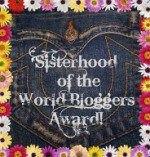 Every time I read an awards post I so admire the blogger because I know they are so time consuming. 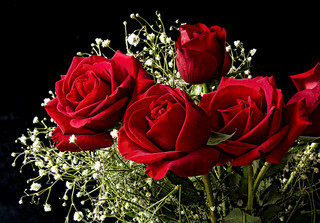 Thanks though you do know I was delighted you thought of me! 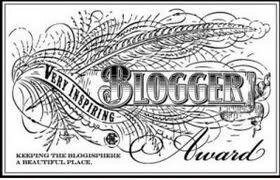 When I first say an awards free blog I kind of thought “how rude”. Well not anymore. It is a good way to learn about other blogs especially newer ones and I do enjoy reading them. I don’t think it’s rude at all! I feel much the same way. It’s still all so new to me. I’m just trying to figure out what works and what doesn’t. Tric, as I said before, your honesty and light is enough return for me. Thanks Susan. How someone as nice as you follows me, amazes me. 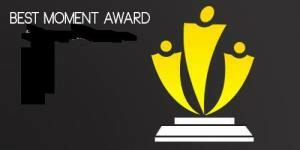 I don’t understand the fuss about awards. I’ve been nominated for a couple. Presumably this means I am supposed to do something? I dunno. Don’t care either. Whatever it was I was supposed to do obviously did not get done. Have I therefore committed some blogosphere faux pas? I have no idea. And I don’t care either. Does this make me rude, arrogant, or something else? Don’t know. Don’t care either. Am I here for other people or for myself? Well no, I don’t. But that does not mean that I begrudge others enjoying the awards thingy if they wish. I just have no personal interest in it. I do understand that there is the chance that if others nominate me for awards and I ignore the expectations that go with those, then those people might get their noses out of joint… but well – that’s really not my concern either. Ha ha. Afraid not famous just lazy! Thanks everyone was so good to nominate me. I am waiting for the announcement of the shortlist but not overly hopeful, but you never know. I am still loving writing and that is the most important thing. I know exactly what you mean. I understand the appreciation and the subsequent procrastination. My nominations have been piling up for months, and although my intentions are good, my resolve is weak. Good for you for making a stand! I feel so free. I have great respect for other bloggers and am mindful of the effort that goes into preparing that award post and linking your blog. Everyday without fail when I was wondering what I would post I would feel guilty that I was not doing an award post. I still feel bad. I do remember quite a few who nominated me but if I mentioned them and left out others that would be awful. So I did this apology. Not perfect but I had to do something. It must be a great relief. My awards dog my conscience constantly. I like the way you handled it though. I’m sure I”ll get there eventually. I’ll be watching and chuckling! Haha! Thanks for the support. i totally understand and i am in exactly the same position, though i have not issued my public apology yet. i am so happy to receive them, though i am so horrible in the tech arena it may still take some time to sort out my tasks involved in accepting these. i feel bad knowing they are hanging in limbo and perhaps your post will be the final push i need to take action on these. i think your idea of highlighting other blogs as a way to give back is a wonderful and mindful idea. I look forward to reading your “apology”. My favourite part about awards was the reading other blog nominations so highlighting other bloggers without troubling them seemed the way to go. I have seen others doing it in different ways and I am enjoying reading during the week now as I have to be thinking “freshly impressed” as I do. It is like my own little private “like” button. Ive seen those awards flying around, i think i even received one but i didn’t know it was mandatory to do all that follow up. I just thanked the person who sent it. I loved your post, your honesty! Thanks a million. You are lucky you didn’t know what you were supposed to do as it is a lot of work!